Berlin hackathon. This giant bubble warns legal tech against becoming a bubble. I recently visited Berlin Legal Tech Hackathon and Kharkiv Legal Tech Hackathon. Here I am going to try to compare the two. Comparing legal systems and hackathons in Germany and Ukraine has recently become very popular (if you’re into that sort of thing). 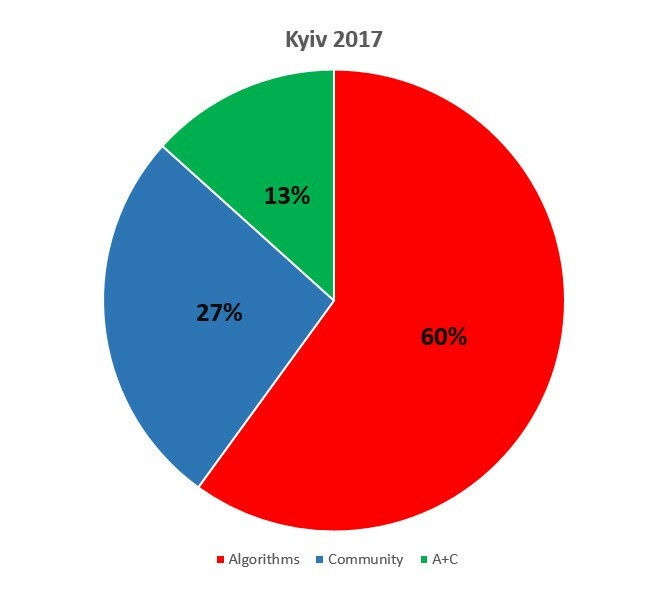 Here you can read about last year’s Kyiv Legal Tech Hackathon (a review by Holger Zscheyge) and here is an article about the Kharkiv hackathon by Nikita Podgainiy (available in Russian and Ukrainian). So, I kept wondering what Ukraine and Germany had in common in terms of legal tech. I am going to focus on projects and leave out an organization, sponsors, and stuff like that. I am also going to talk about last year’s Kyiv Legal Tech Hackathon and things that have changed since then. In my research, I used methods of classification and generalization. People-based, where people engaged in this project are a core value and a unique asset and where product value and performance depend on these people. I’ve decided to stick to this approach. However, this time I am going to use the terms ‘rule of algorithms’ and ‘rule of community’ since they seem more appropriate. Besides, an ‘algorithms + community’ situation may occur. The site looked very creative. 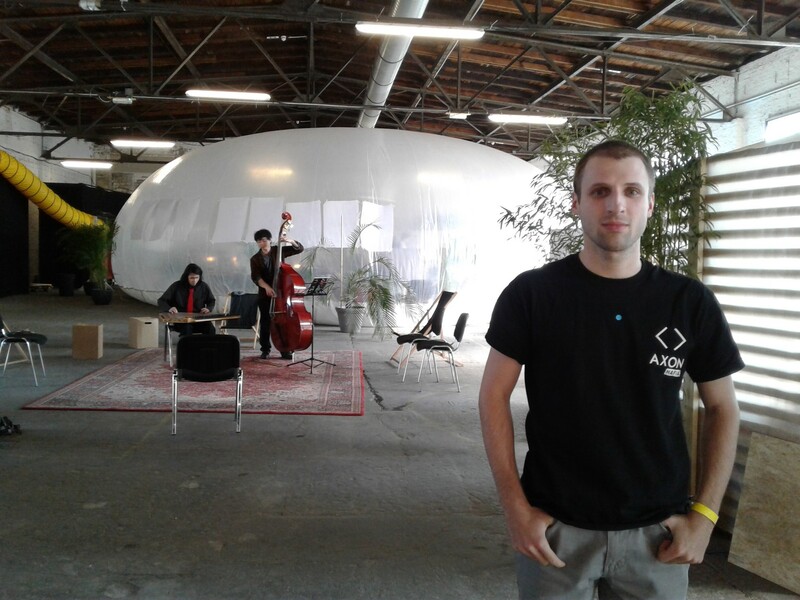 What impressed me most was the huge polyethylene bubble where the hackathon officially started and in front of which the final pitching took place. In addition, the hosts handed out color sticker badges to all participants. Lawyers wore green badges and programmers wore orange. Being a legal engineer, I got a blue badge. Our badges helped us socialize and build good teams. Problem: used car selling scams. Solution: store information about cars on blockchain. Verdict: algorithms + community since blockchain is a good thing, but you have to get people in. Problem: contracts are hard to draw up; besides, it’s hard to detect errors in them. Solution: upload your file in a web browser and the app will give you feedback on your document. Verdict: rule of algorithms as it is. Problem: ICO legal support is expensive and complicated. Solution: complete ‘how do you name your token’, ‘how much do you want to raise’ and ‘your ICO purpose’ fields and click the ‘LAUNCH’ button. The application will generate documents for you, including a smart contract. Verdict: rule of algorithms since here we use templates, right? Problem: at times, negotiating is complicated, for instance, when it comes to divorce and divorce settlement. Solution: this service helps parties sort out their priorities before negotiations. You will have to answer a number of questions, such as “What is more important: your car or your kids?”, “What is more important: land or apartment?”. After that, the service will help you get ready for negotiations. Verdict: rule of algorithms and it is fabulous. Problem: lawyers often have to deal with complicated issues that only other lawyers can handle. Solution: create a ‘stackoverflow for lawyers’ with a transparent check for answers and lawyers. Here’s the MVP: http://jurknow.de/. Problem: making a contract and agreeing its terms and conditions is not the most inspiring experience for parties and does not always work well for their further relationships. Solution: this is a service that is going to help parties assess and agree at least on the essence of a contract. The service uses machine learning: it collects user experience in similar agreements, which may come in handy. 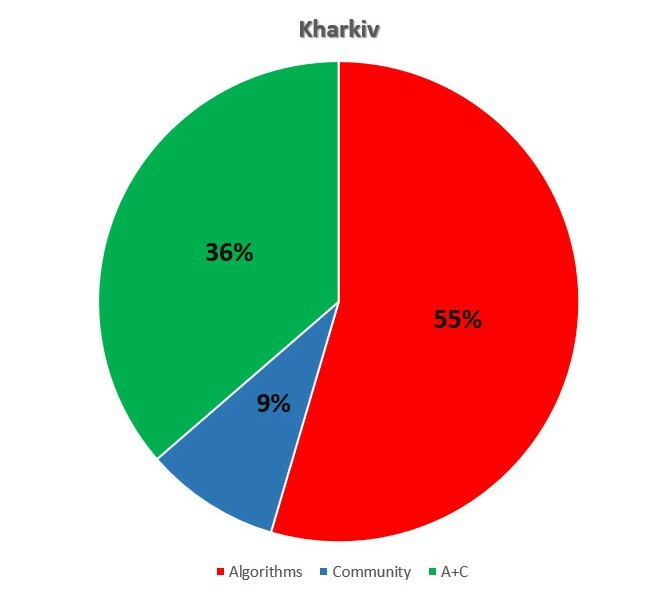 Verdict: rule of algorithms; however, the community also works on machine learning. But the algorithm is essential here. We spent two days thinking how to build it. Problem: at times, contracts may disappear; at times, they may get forged. Solution: keep your contracts on the blockchain. It is going to work as ironclad evidence in court. Problem: for artists, raising money is hard. Solution: artists should tokenize money raising using a special transparent service. Verdict: mostly rule of algorithms. Problem: lawyers are expensive and often hard to find. Solution: type a line describing your problem and the system will provide you with a legal framework and recommend lawyers specializing in your area who are ready to help you. Verdict: algorithms + community. We have the algorithm but we do need a lawyer. Problem: somehow related to making contracts. Solution: Reclaim control over your legal life! This app is your personal contract manager. Verdict: it’s mostly rule of algorithms. Access to Justice nomination: once again, it’s Bamboozle (rule of algorithms). 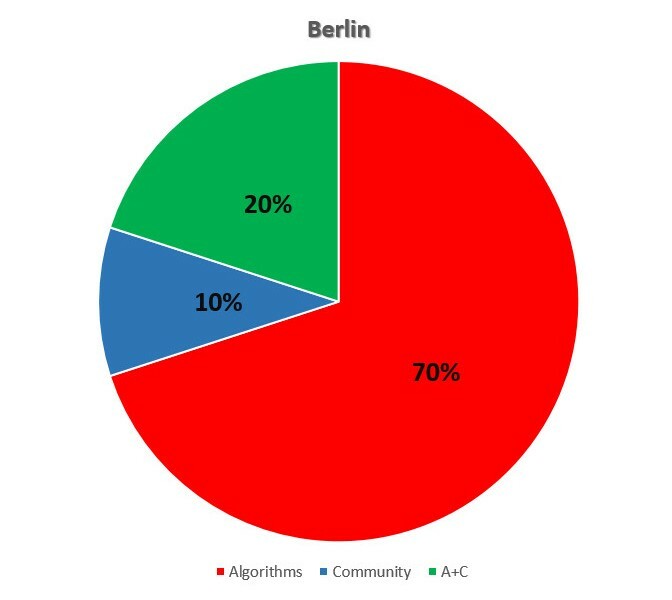 So, Berlin hackathon definitely favored these rule of algorithms projects related to digitalization and automation of complex processes, such as preparing complicated negotiations, ICO legal support, and supervising legal processes. Clarity Score: I am curious about the level of analysis and feedback they are going to provide. Now let’s get back to Kharkiv and see what’s going on there. Problem: companies spend a lot of money and time dealing with overwhelming amounts of incoming mail. Solution: automated mail processing system (sorting, forwarding, record keeping, etc.). Verdict: rule of algorithms, but its strongest point is also its weakest one because who is to blame for deleting or ignoring some important email. Problem: Ukrainian patent office database is inconvenient and works very slowly. Solution: convenient and fast searching tool for working with the patent office database. The Ukrainian government is the main competitor here and it’s not a Patentbot. Verdict: rule of algorithms as it is. And that’s wonderful! Problem: in Ukraine, many people don’t go to court because of numerous complicated procedures and lack of fair court rulings, in particular, when it comes to issues involving community facilities. Solution: a service that helps you draw up a claim, include evidence, find allies and lawyers, find some reasonable sample documents, etc. Verdict: rule of a community since to become really useful, this service needs to engage lawyers and experienced claimants. Problem: at times, it is really hard to find out about forthcoming events for lawyers in your town, while finding videos recordings/streaming of events that have already happened may be even harder. Solution: one convenient platform (website + application + bot + blog) containing a calendar, reviews, broadcasting/streaming of all events for lawyers taking place throughout Ukraine. Solution: a two-edged service that does headhunting for turquoise companies and looks for turquoise companies for those who want to get a job. It works great for Generation Z guys (it replaces HR officers, provides multivariate testing (for example, it can define your type of humor) online interviews, etc.). Verdict: algorithms + community since machines won’t be able to handle all kinds of tasks here. Problem: when you send a letter, you lose control over it (you don’t know where it goes, the code it gets, whether you will get a response, when you will get a response, whether this response will get to the proper address, whether it will arrive in time, etc.). Solution: a reliable email delivery and control service on blockchain. Net members pay for its maintenance. Problem: people don’t want to read legal documents: they sign contracts without reading them, click ‘I Agree’ buttons without looking, and then wonder how they’ve ended up with some obligations. Solution: this service makes any legal document look like a comic book, where you get to see what you’re engaging yourself in, your key obligations and liabilities. Verdict: when ‘made by hands’ becomes a rule of algorithms. Problem: violence against women (and against men) in the global context. Solution: a chat-bot advising on multiple issues (what is violence; cases when violence has not yet occurred; cases when violence has already occurred; where to report violence, etc.). Problem: executing a contract is a distressing experience, especially when you have to focus on numerous details. Solution: don’t let your partners go into a contract’s wilderness; let them agree on the basic essentials, while the system will deal with the rest (interestingly, a contract template will take into account lots of useful things, such as current trends in court practice, etc.). Problem: the ins and outs of tax assessment plus other tax-related issues. Solution: an automated tax assessment system featuring numerous convenient functions. Problem: infringements of IP rights. Solution: a service for IP rights protection: you inform about your IP rights being infringed, the service gets a takedown notice going and helps you live your life. So, Kharkiv hackathon went for projects people need most: events for people and about people and some help in preparing court cases. Other winners include Patent Legal Monitoring and a smart mail sorting service. “Memelex”: I’d rather read comic books instead of endless legal documents. By the way, video comic books seem like a good idea, right? Algorithms win everywhere. Good Legal Tech is not another website for hungry lawyers or stuff like that. But let’s be realistic, using blockchain for everything is not a good idea. A decent Legal Tech innovation is a well-built set of algorithms appreciated by users and not too expensive for a startup to maintain. People in Germany get it. But sometimes you have to add a bit of community momentum to your project. It is going to be harder to start, but it’s worth doing. And people in Ukraine know it. To those who wanted to win but did not succeed – think of it as if you’re climbing a mountain and nothing bothers you and it will work out just great for you. Good luck!